In addition to all my other hats, I run DAEDSound.com which makes original and modified electronic instruments with an emphasis on DIY and circuit bending. I've made quite a few custom synth modules from PCBs and even have a few prototypes of original designs. 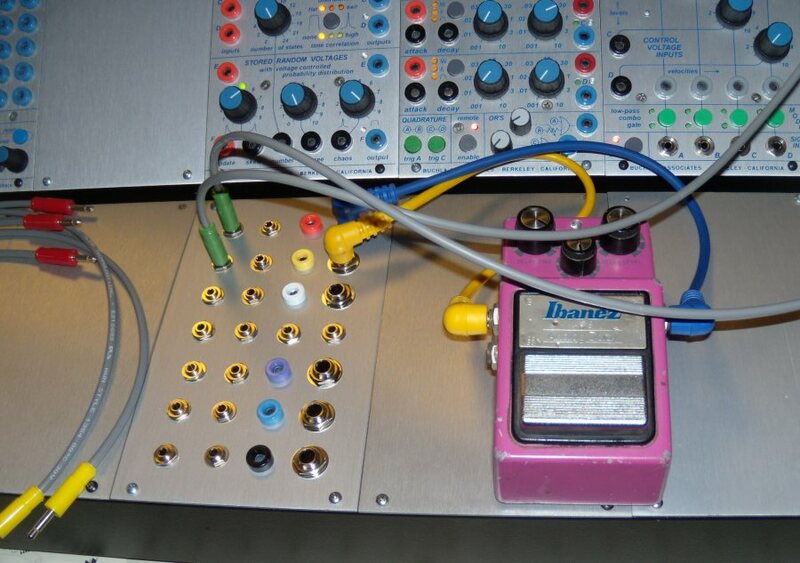 The Buchla case I have has a lot of real estate and it was always my plan to make some custom pieces to match the 200e system. Given the learning curve of the 200e and it's finicky nature I decided to start with a simple patch panel integrating the Buchla standard of "tinijacks" with 3.5mm, 1/4", and Banana jacks. This will allow me to easily patch my existing modulars (see previous post re: "Familiy") and it will also allow me to send audio signals to various external sources such as effects pedals, mixers, etc. The 207e mixer/output module in my system doesn't have 1/4" jacks so those were essential if I didn't want to keep using adapters. I also wanted to make it easy to keep 3.5MM and tinijacks separate since there is conflicting wisdom about using the same patch cables for these two slightly different sized jacks and the wear and tear on the connectors as a result. Finally, I wanted to allow the mixing of my large banana system as well as possible mix audio and CV signals within the 200e. Buchla and Associates have specifically designed their system NOT to do this but every other modular from the Arp 2600 to Serge do allow this. B&A used a very involved buss system which allows them to operate the preset manager and midi signals in the 200e and their reasoning is certainly sound for what they were trying to accomplish but given the expense of adding another Oscillator or even an LFO it also makes sense to wring as much utility out of what you have as possible. Hence, patching audio into a cv signal may make for some additional options or running CV into an FM input would most certainly cause some aural havoc. 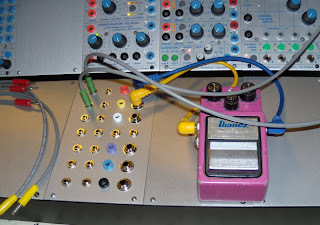 To my mind this is what a modular what meant to do so having that as an option once in a while is a good thing. The panel I made has six independent sets of jacks and an independent four "tini jack" multiple for internal 200e signals in the middle. All appropriate jacks are wired to common ground. I considered making some passive attenuators but will save that for another time. For now it's a simple, clean design that does one thing and does it very well. I still need to verify if there is any concern or technical reasons to keep the audio and CV signals and buses separate in a 200e but since using external CV signals work fine I am hoping it's safe to do the same internally. We shall see.